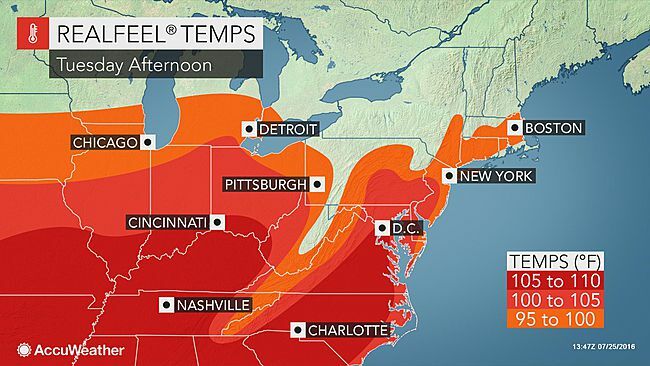 A stifling heat wave will remain entrenched across the mid-Atlantic and Northeast this week. In wake of a stormy Monday across the Northeast, the heat will not budge in areas from Washington, D.C., to New York City and Boston as AccuWeather RealFeel® Temperatures soar into the upper 90s and lower 100s F through this week. "The heat wave will continue unabated this week," AccuWeather Senior Meteorologist Dave Dombek said. Crowds gathering for the Democratic National Convention in Philadelphia this week will be in the midst of the heat wave. AccuWeather RealFeel® Temperatures of 95 to 105 are expected during the afternoon hours before they settle into the 85 to 95 range during the late evenings. This could be one of the longest heat waves, which are defined as three days in a row of reaching 90 or higher, in recent years for some of the major cities along the I-95 corridor. 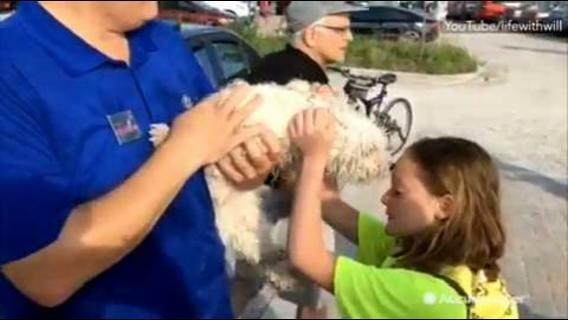 For instance, New York City had a six-day stretch of 90-degree highs in July of 2013. "If every day this week through Thursday reaches or surpasses 90 [in New York City], we will beat that one [with a total of seven 90-degree days]," said Dombek. Staying safe during the heat can be achieved by limiting outdoor activity between noon and 5 p.m., drinking plenty of water and seeking shade when possible while outdoors. While dangerous heat will persist, some in the region will get a brief break from extreme humidity. "A classic midsummer front will cross the region early this week, ushering in some relief to the excessive humidity, but it will do little to put a dent in the heat," said Dombek. The interior Northeast will observe the biggest drop in humidity Tuesday and Wednesday, but less humid air will also extend toward the coast to include areas from New York City to Boston. "However, areas from southern Pennsylvania, including Philadelphia, to northern Virginia will largely miss out on the humidity relief," Dombek said. 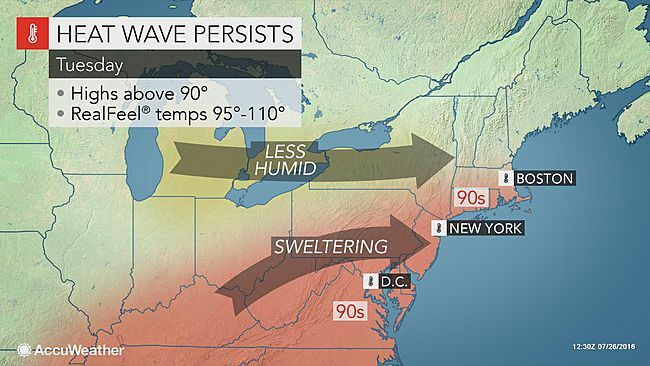 Oppressive humidity will resurge northward across the entire Northeast late this week. Although the humidity will make a strong comeback Thursday and Friday, cooling downpours will develop over parts of the region by the weekend. In some cases, the downpours could help to briefly lower high temperatures by as much as 10-20 degrees. "Overall, the weather pattern looks to remain a bit warmer than normal well into early August," AccuWeather Senior Meteorologist Dave Samuhel said. "This will not only be across the Northeast, but across much of the country."